While our customers are wholesalers, Packard knows that you, the contractor, have a choice. You are often presented with many buying options, and being well-informed about your purchase can help make your job easier and more successful. This is why we have dedicated a section of our site for contractors. In this section, you will find helpful product tips, tools and some clips from our training classes. We’ve also provided a distributor locator so you can find the nearest wholesaler who can give you access to Packard products. Sometimes fan blades are rated by cubic feet per minute (CFM), but blower wheels aren’t. Why? Sometimes you might find documentation on axial fans (fan blades) that shows the cubic feet per minute (CFM) produced by the fan. That same document will probably show different CFM’s based upon the static pressure the fan is exposed to. As the static pressure increases, less air is produced by the fan blade. However, you probably will not be able to find that type of information available for blower wheels. For a blower wheel to perform effectively, it typically must be matched with a blower housing. The complete assembly, consisting of a blower wheel and housing, we call a blower. The proper technical name for a blower is a centrifugal fan, in that the air inside the housing is pressurized through centrifugal force. Without the housing, the blower wheel would not be able to pressurize the air sufficiently to move the air through ducts or plenums to get it where it is needed, and at the correct volume. The performance characteristics of a blower assembly, that is, the amount of air developed through the blower, is affected by the amount of static pressure in the system. As static pressure is increased in the system, the amount of air developed with the blower is reduced. The total CFM produced by a blower wheel is only determined by the specific housing it is in, as well as the static pressure of the system in which the blower is applied. The correct amount of air delivery in an HVAC or refrigeration system is critical for proper heat transfer. Selecting the proper fan blades and blower wheels is essential for developing the needed CFM. As a technician, always be alert to the static pressure in a system and how it can affect CFM. Packard has developed a complete HVACR critical components training program, which has received approval by North American Training Excellence (NATE) - the leading certification program for HVACR technician, and the only test approved by the entire industry. Below are some video excerpts from our instructor led training courses which we hold at Wholesaler locations nationwide. Many techs are now serviceing furnaces equipped with Electronically Commutated (EC) motors. Demonstrates the ease of installation of four fans in 17 minutes with only hand tools. 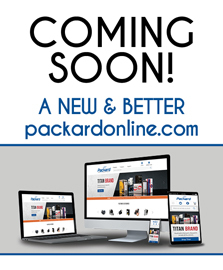 A new online experience coming soon!